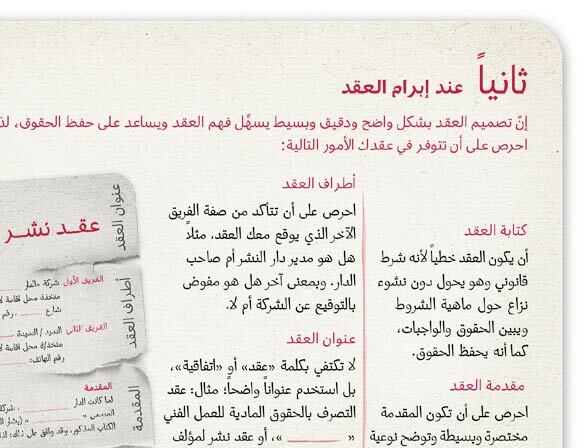 We’re glad to announce the free download of ‘يوميات فكرة مسروقة’ a handbook for illustrators, writers, and the creative community about the copyright law in lebanon. 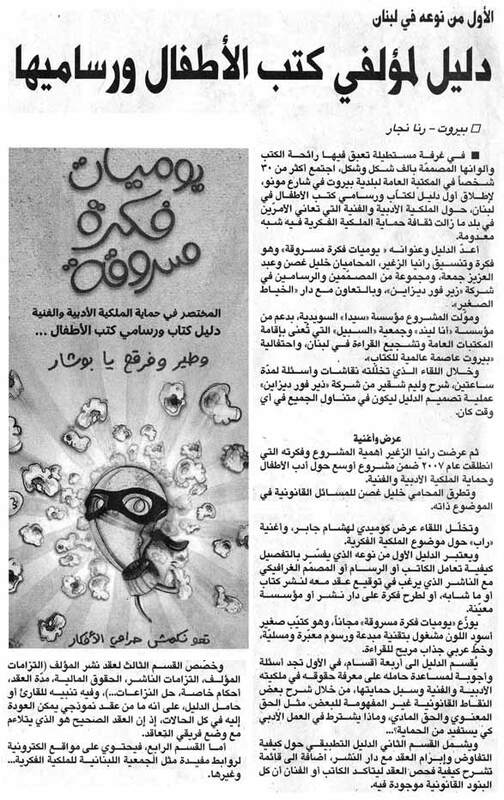 the complete process, photos of the final product, the invitation for the launching event of the book, a newspaper article about the event, useful links, and the creative commons license governing ‘يوميات فكرة مسروقة’. 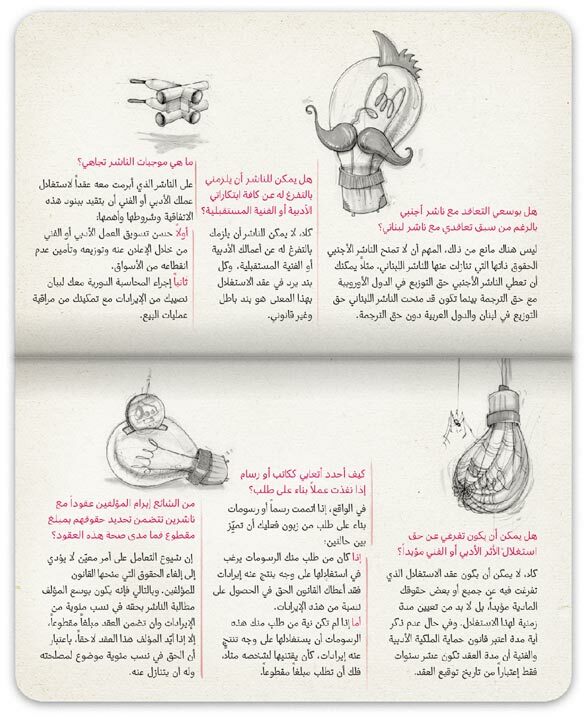 Alright, this is a handbook in arabic, about the copyright law in Lebanon for illustrators, writers, and all creative people. Yet it’s written, designed, and illustrated to be so friendly that you will never feel you’re reading law material. The book is distributed free of charge in both it’s print-based version, & digital version. Get your soft-copy here, or contact Rania Zaghir for a hard-copy. 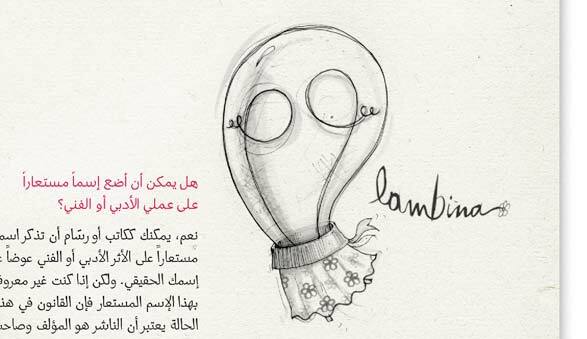 The project was initiated by Rania Zaghir founder of Al Khayyat Al Saghir, a publisher of quality children’s books, in arabic. 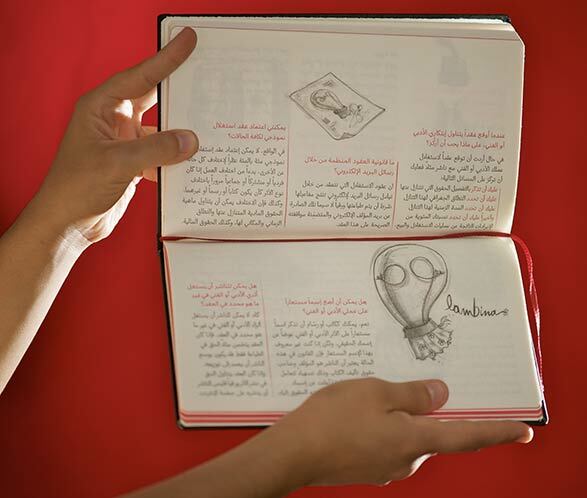 The book is an initiative to educate the creative community, hoping for it to be a catalyst for illustrators and writers to stand up together for theirs rights. Let this be a forum to do just that; Leave a comment about all the cases where you had your ideas stolen, and all the projects that were left unpaid. We can all learn from each other and find ways to prevent things like that from happening. We aimed for making a practical handbook people would keep keep with them all the time, instead of having it sit on a bookshelf. This is why we questioned everything, and did a lot of things differently. Something that illustrators and writers always keep with them is a sketchbook, this is why the end product (below) looks like a sketchbook, with black hardcover, red bookmark, and moleskine proportions. Even the title (custom-made) is not printed on the cover, but embossed to be as subtle as possible, and to allow a margin for each one to personalize his own. The beginning of the reference area starts with a red spread (separator), and the red bookmark comes pre-set at this position for easy navigation. A sample spread from the final product with type & illustrations hand in hand :). next we’ll see how this came to be. Or too childish (below) that people won’t take seriously. For budget requirements we aimed to have one color printing, but soon enough this proved to be giving dull results, especially partnered with the type of content we’re dealing with, and so an additional color to our monotone palette gave much more value, and didn’t break the bank at all. 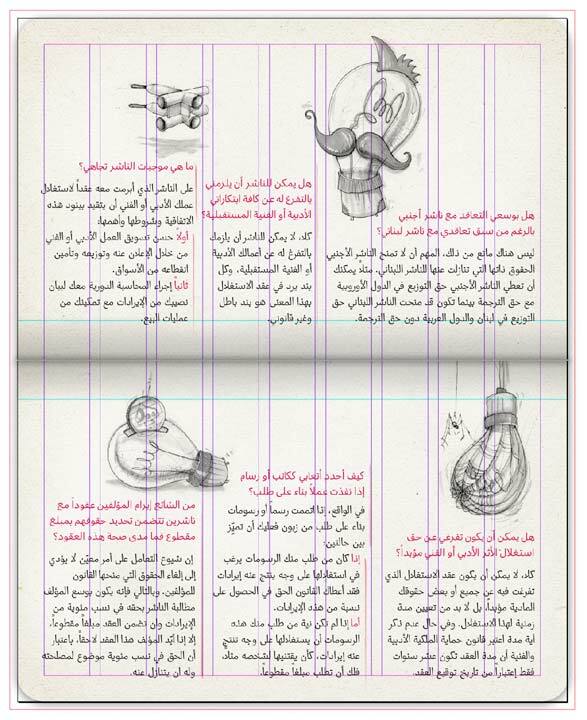 While the sketch area can be used horizontally and vertically, you’ll notice the content area is in landscape format, which is unusual for a book. But after countless trials with layout of type and image, a portrait format with the narrow width of the book proved to be inflexible, and too structured to the point of being boring. We also couldn’t change the proportions, as these are what creative people are most comfortable with. 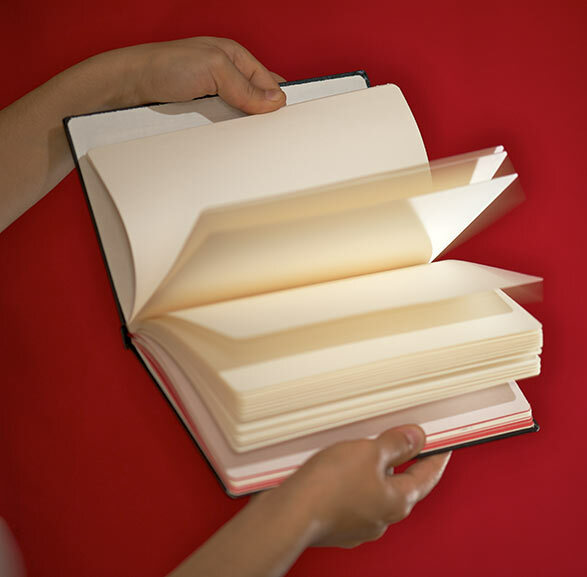 Rotating it horizontally proved to be a more than ideal solution, and flipping the pages was not cumbersome like we originally though it would be. The landscape format allowed for a grid of 9 columns, comfortable gutters between the columns, and ample margins on the edges. These columns could be joined and used as a single text column in any combination possible (seen below), which made the layout extremely dynamic with much variations, while not seeming chaotic. The lack of a horizontal grid added further flexibility, while a hanging line at the bottom of each page grounded all content together. Lots of thought went into each illustration to give it slight pun and humor to lighten up the mood visually and intellectually. A checklist is included in the book to make sure you cover all your bases when negotiating a contract. Since this is a practical handbook, people need to use this checklist, not just look at it! You’ll notice below that there are blank columns where you could write the name of each contract you’re negotiating, and check/uncheck all that apply right on the handbook. We also illustrated and designed the invitation card (below) for the launching event which took place in Assabil Public Library, Mono Street. If you have a question, a story, or would like to let us know what you think, leave a comment below! this before. So good to find someone with unique thoughts on this subject. Where can we get it from ? 20. I am really impressed with your writing skills as well as with the layout on your weblog. Is this a paid theme or did you customize it yourself? Either way keep up the nice quality writing, it is rare to see a nice blog like this one today.. This is just amazing 🙂 what a great idea!! This is just amazing..what a great idea! Where can I find this book in Egypt ? Is it free to download it through the Internet ?? it’s out of print, but you can still download it for free using the link in the beginning of this page. Such a great and useful idea. 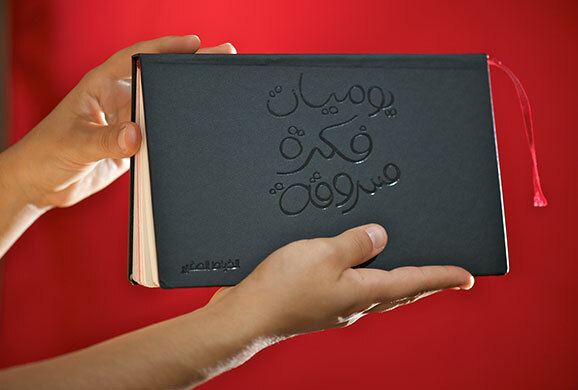 i love ur comment 😀 😀 wow it’s a great sign that this copyright notebook is used by someone who can’t read arabic, does this mean that everyone in lebanon who ‘can’ read arabic must be using it? let’s all try to do just that! 🙂 william. This is a very practical piece of creativity ! very functional and esthetically pleasing DESIGN ! damn i got hardons for Functional design ! this world is filled with maximalism! and THEN you see stuff like this… FUNCTIONAL and Beautiful ! 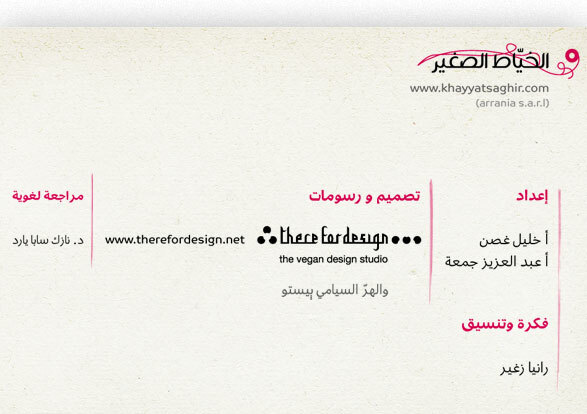 we love it when people are aware of all the hard hard work that goes into our designs! 🙂 10x a lot! really appreciated 😀 love. GreatWork people! A really nice creative look at the harsh lebanese law. .-= psyx´s last blog ..Devious Journal Entry =-. 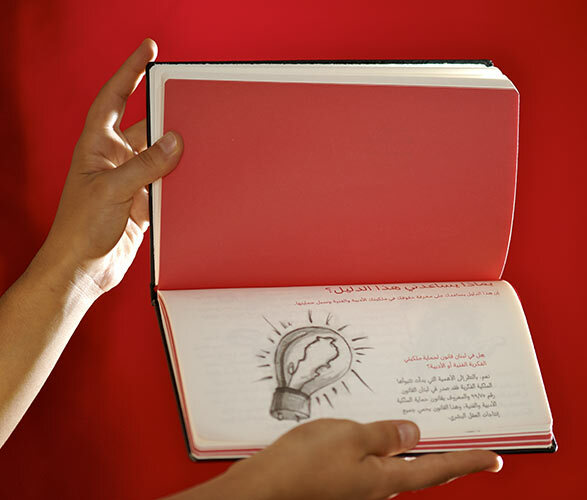 A well designed and user friendly book; no little detail escaped your attention! …Thanks for sharing the design process! if you have any suggestions, post them here! love. I love it soo much.. I hope this blog will be a space for all children’s authors and illustrators to communicate about their rights. Great job! This is a much needed manual for all concerned in the publishing business.